our perfectly imperfect life: Love this chick. I gotta brag on my girl. 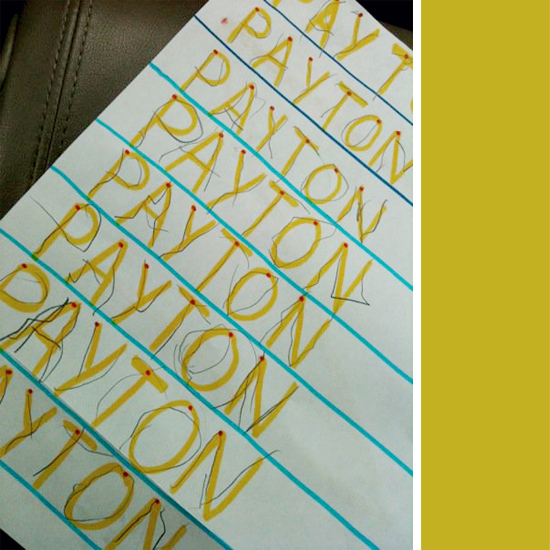 For the past couple months, Payton has been working very hard on learning how to write her name using correct letter formation. And she loves it. She is so interested in learning ... she is amazing! Today during occupational therapy she traced her name with awesome precision ... independently, on her own! I seriously am so proud of her. She amazes me more and more every day. Love this chick. That's so great Bethany! She is amazing! Way to go Chicky! You can do it! I would frame it :). but why are they using Caps? odd. Cathy, it is pretty much protocol for kids here in the US to learn using caps first. That is just how it works. way to go Payton.her writing is better than mine! woo hoo! Very nice! It's great that she wants to learn and is doing so well! That's awesome!! I know you must be so proud!! That is so amazing! We are so proud of you, Chicky!!! She is doing amazing Bethany! That is impressive!